Time For Owls — Raptor Education Group, Inc. 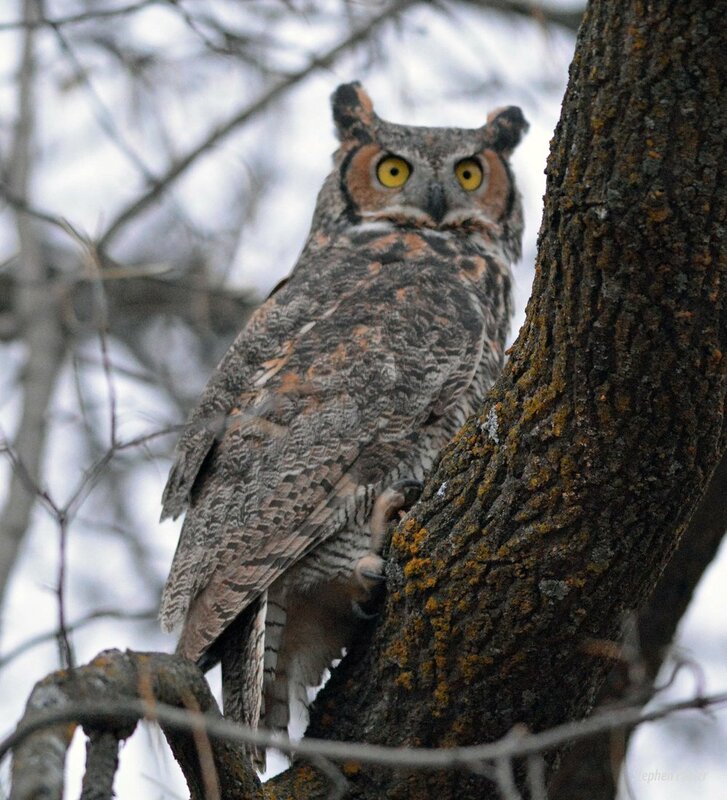 This is the time of the year when Great-horned Owls are thinking about having a family. We recently released two Great-horned owl patients just in time for them to integrate into the process and be able breed early this spring. We are starting to get calls from people wondering why they are hearing more owl calls. I attached a link to the Cornell Lab of Ornithology that will give you audio of Great-horned Owl calls below. Right now, the owl pairs are "advertising" their territory to other owls. That way there can be no question that they have set up a territory and are planning on having a family there. Other owls will not be welcome in their home territory. Advertising is the first step in "strengthening the pair bond" for the owls. Soon they will begin "duet-calling" which is when the male and the female call to each other. The duet aspect of the "Hoo-hooo-hoo", male and female calls will get closer together as actual breeding gets closer. The female is the larger of the owls, but the males voice is deeper as he has a larger voice box. Owls are our earliest nesters in our country. Owlets are hatched when the weather is still frigid in late January or February. Of course, in the warmer parts of the country breeding is underway earlier. Steve and Evie Fisher did the honors of releasing our most recent Great-horned Owl patients. So great to have them back home where they belong. Both of these patients had been hit by vehicles and were rehabilitated. A handsome male Great-horned Owl recovered from being hit by a car and is ready to go home. Steve and Evie Fisher prepare to take our soon to be former patients to release them back to their wild. Nothing compares to the eyes of an owl. Pre-release physicals include weighing the birds, checking the feather and body condition. The final step to the pre-release physical is to give them a full crop of meat so they have one more meal on us before they have to hunt. First seconds of freedom. Good luck sweet bird and stay away from cars. The male is delighted to see the wild again.